1. Enjoy every bite you eat. Don’t stuff something down your throat that you don’t really like the taste of–that you don’t really have a hankering for–just because it’s mealtime or you’re hungry or it’s sitting in front of you. It’s okay to feel hungry once in a while, as you wait for the food you really want. Most of us go through life snacking whenever our stomachs get a little grumbly. Let yourself feel hungry before a meal. It’ll wake you up! You’ll enjoy it more. 2. Drink lots of water. Good for every part of you. 3. Eat cookies and potato chips if you feel like it, but enjoy them. Eat a handful, not a bagful. 4. Satchel said avoid fried meats. I’d say avoid all meat, or try to go easy on it. Bad for the animal, bad for the planet, bad for your body, bad for your soul. 5. Never ever go to McDonalds or any other fast food restaurant, unless you need to use their toilet. Bad for the planet, bad for every part of you. 6. Enjoy rich foods, like buttery, cheesy savory pastries, but have that be a small part of your meal, and eat a big salad with it, or a big bowl of soup. Fill up on fruits and vegetables. 7. Satchel said “jangle gently as you walk,” which I love. Do it every day! Go for a walk, or a run, or jump around your living room. Get your heart beating, and your blood flowing. I guess that’s it, for now. Sorry to get all preachy on you. But it’s all stuff everybody knows anyway, right? Duh. Anyway, in the interest of loading up on vegetables, which is part of tenet number 6, let me tell you about these two salads. I make a salad almost every night, but I rarely talk about them because they’re gone before I can make a record of their existence. spinach and arugula, and added a handful of chopped hazelnuts. And that was it! They were delicious. They became lovely and crispy. I’ll definitely be having these again. The second had bright green asparagus, bright green castelvetrano olives, capers, almonds and a little goat cheese. 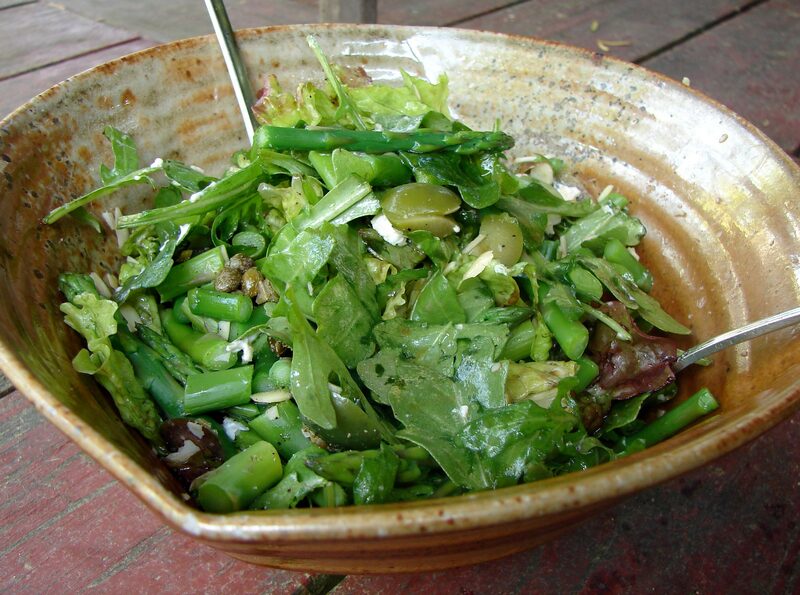 Simple and green and crunchy. Here’s Louis Armstrong Tight Like That to go with the trumpet mushrooms. I think it’s such a perfect song! Wash and dry some red leaf lettuce, some baby spinach, some baby arugula. Or any other mixture of greens that you like. Put them in a boil. Drizzle some olive oil over them. Lightly toss them. Shake a little sea salt on them. Lightly toss them. Drizzle some balsamic vinegar over them. Lightly toss them. This will form the base for both salads. For the trumpet mushrooms. Wipe any dirt off of them, and slice them lengthwise into batons. Warm some olive oil in a frying pan. Add the mushrooms, 1 teaspoon of chopped rosemary, and a pinch of thyme. Stir and fry them until they’re golden brown. Then add one clove of garlic, minced, and a splash of balsamic. Remove from the heat and allow them to cool for a second, and then arrange them over the salad greens. Top with a handful of chopped toasted hazelnuts. Season with plenty of freshly ground black pepper. For the asparagus. Take about half a bunch of asparagus – as much as you can fit your fingers around. Cut off the woody ends, and cut the rest into half-inch lengths. Drop them into a pot of boiling water and leave them for about 5 minutes till they’re very bright. Tip them into a strainer and run cool water over them. Let them drain. Peel and chop about 1 cup of castelvetrano olives (or any kind you like!). Crumble some goat cheese (about 1/4 cup) over the greens and give them a toss. Then add the asparagus, olives, 2 t capers, and a handful of crushed sliced almonds. Season well with black pepper. Eat! 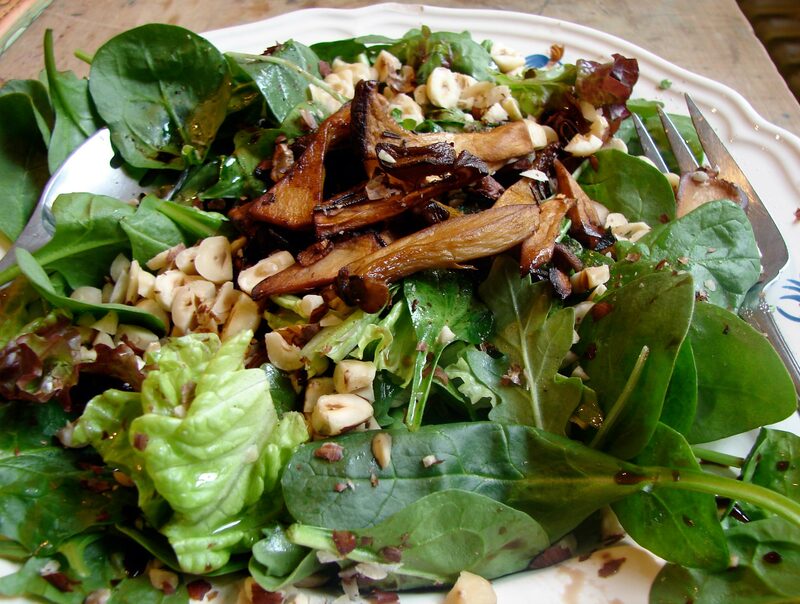 This entry was posted in recipe, salad, Uncategorized and tagged almonds, asparagus, castelvetrano olives, greens, king trumpet mushrooms, royal trumpet mushrooms, salad, spring by Claire. Bookmark the permalink. Saw you post on The Kitchn, via Apartment Therapy, and glad I did – these salads sound exquisite!